After finishing 12 certified marathons (and one in Death Valley, USA, that was cut short by about 3km because of a sandstorm in the summer of 1999) I have learnt to count my blessings in each one of them. In the past four years I have raced eight marathons, finishing all between 3:07 and 3:15. By nature athletes tend to be a forward-looking bunch, always wanting more, better and faster. 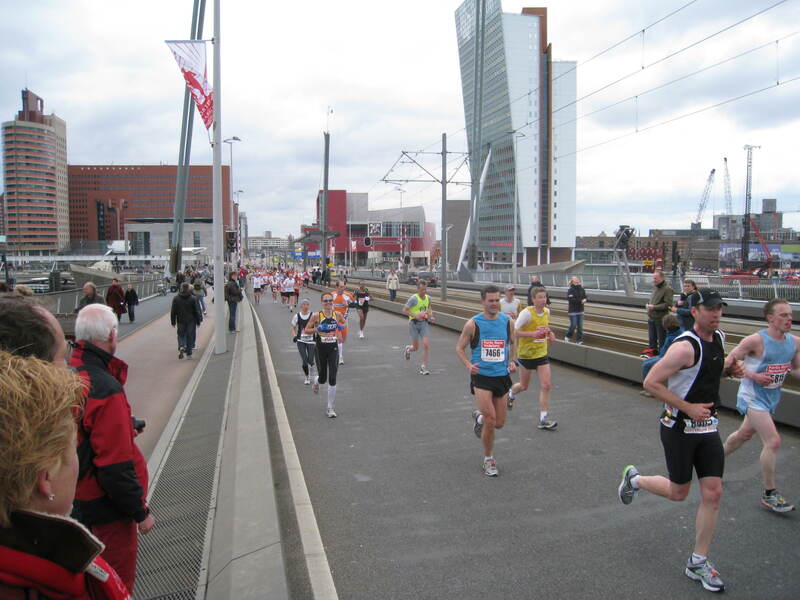 And so it is too with me after each marathon, including the one I ran in Rotterdam on April 11. My finish time of 3:11:51 is my fifth-fastest time and my fourth consecutive sub-3:12 marathon time -- that's a record I should be and am happy with. 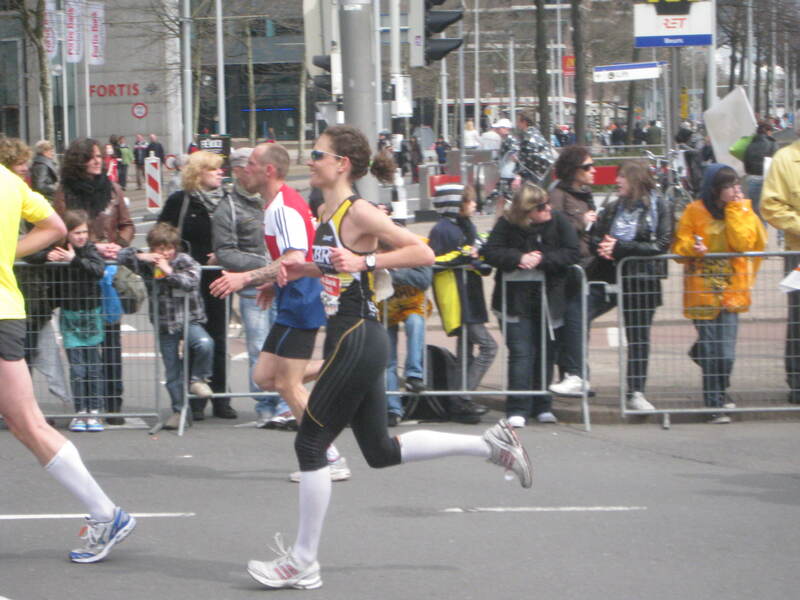 However, it is also four minutes slower than my best time of 3:07:10 which I ran in the 2008 Victoria Marathon. 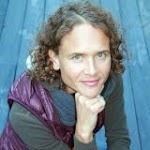 And I am a greedy marathoner--I want more, better and, most of all, faster. So I am contemplating my next race which will be either the Vancouver Marathon on May 2 or the Edge to Edge Marathon on Vancouver Island on June 13. 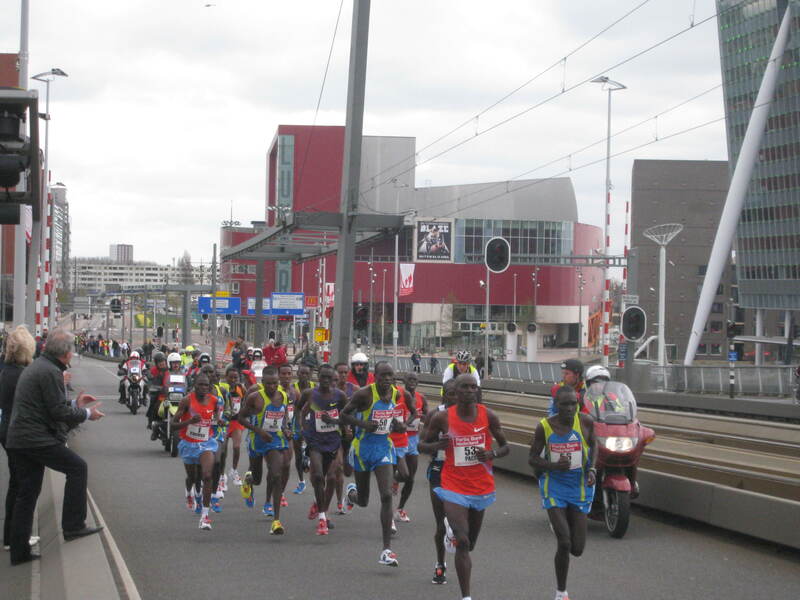 Back to Rotterdam Marathon race day. My alarm rings at 6:10am--the race only starts at 11am. I don't rush to get out of the single bed on the attic of my parent's house in the Dutch polder. I slept well for most of the night, waking up only a couple of times with the always-intimidating realization of having to run 42.195km later that day. I have a hot shower and don my race top, 3/4 tights and compression socks after rubbing a good layer of Vaseline on the soles of feet and between my toes. I also rub muscle-warming cream on my lower back and my calves. I add an old Esprit long-sleeve shirt my mum has given me to stay warm until the start and then throw away. On top I am wearing a long-sleeve hoody and Skins compression tights. My parents are already having breakfast downstairs. My dad will go with me while my mum is forced to stay at home because of a knee injury. I make coffee and a sandwich of white bread with butter and honey I will have in the car. At 7am my dad and I start driving to Nieuwerkerk aan de IJssel where we park the car and take the train. It's a sunny morning, though chilly at 3 degrees Celsius. With little traffic on the road at this time of the day we catch a train half an hour earlier than we planned from Nieuwerkerk to Rotterdam Central Station. My dad and I walk from the train station to the Beurs, WTC, which is about 1.5km. We pass the start/finish area. It's still quiet there. And cold. Cold is good for running. 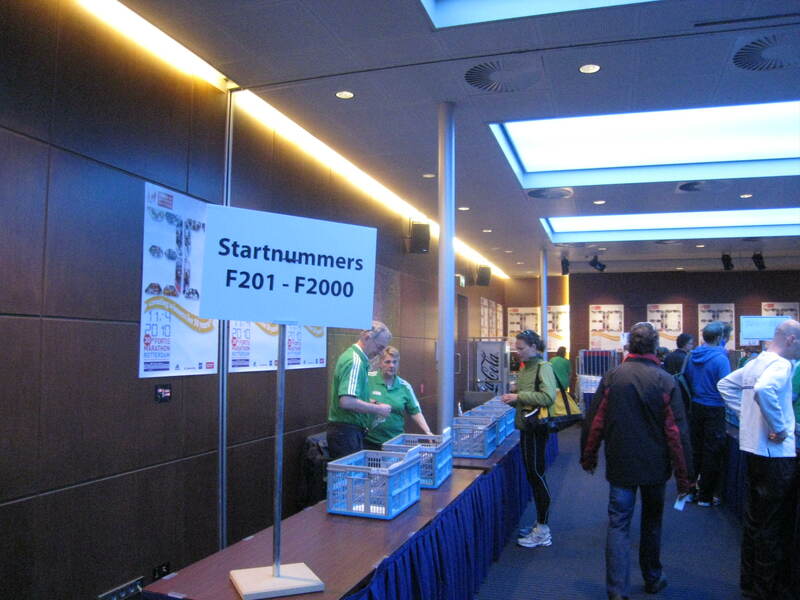 In de Beurs I show my race registration as was emailed to me, and a volunteer hands me an envelope with my race numbers (front and back in this race) and a Dtag, a flexible plastic strip that registers your time as you cross the timing mats on the course. 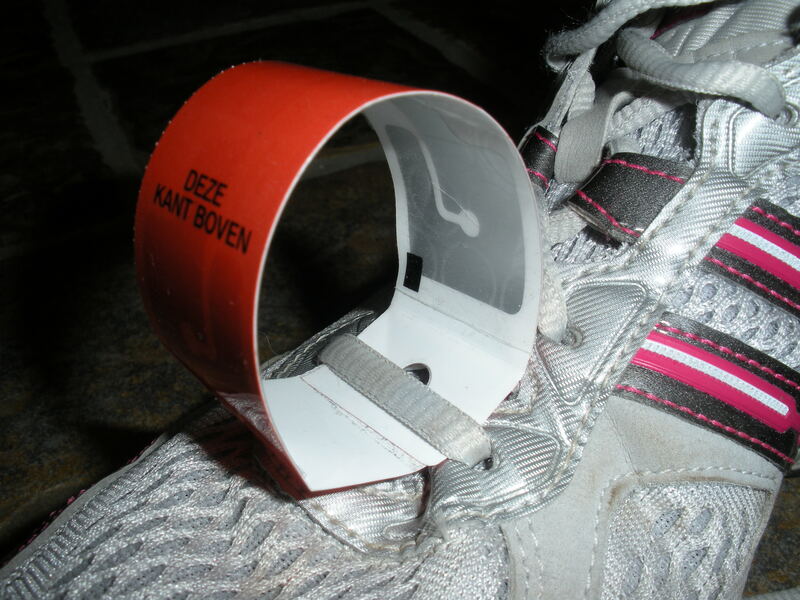 I have never used one before and doublecheck how to attach it to my shoe with a volunteer. My dad and I had already done a toilet stop at the station where, like nearly everywhere in the Netherlands, you must pay to use the washrooms: 50 cents. The ones in the station are/look spotless. Not so in the Beurs building, where today there is a line-up for the men's washroom instead of the usual one for the women's. Runners also need 50 cents to enter. It's now 9:45am. The only thing left to do is finding the place where I can leave my bag with my pre- and post-race clothes which is in or near some school. 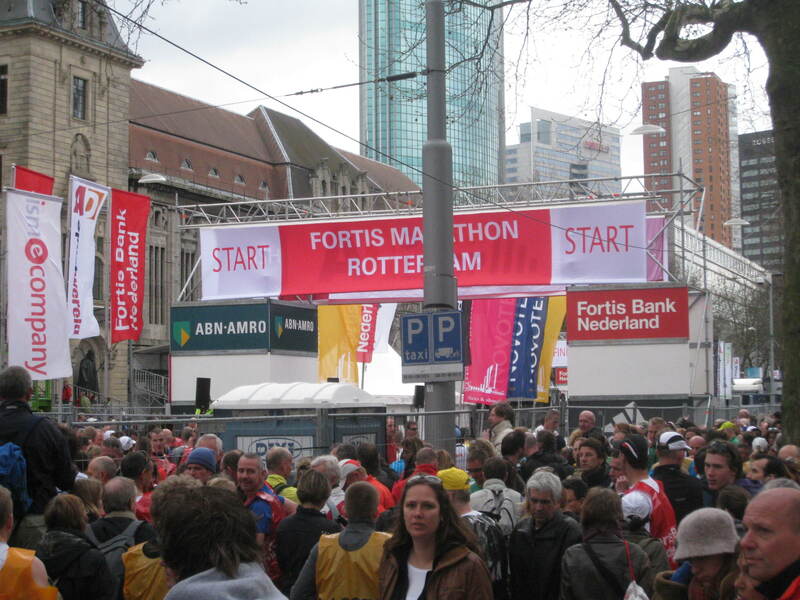 First my dad has a coffee in the Beurs and I sit down on the floor, like many other runners. I am nervous, in a good way. While the night before a marathon I always feel intimidated with the idea of racing 42km, on the morning of the race my pre-race nerves are about getting a good start spot, making sure I have everything I need and just wanting to get started. Waiting for the train earlier this morning in Nieuwerkerk a/d IJssel a guy in his 30s started talking to us about the race, since we are all obviously dressed as runners. When I said that it was going to be fun, he said "It's not going be fun at all, it is going to be a long road of suffering," and a few more statements along those lines. I laughed and wished him well, then focused on positive thoughts: it's such a special day so why ruin it with all this kind of stuff? Then again perhaps it is his way of coping with his nerves and, somehow, enjoying the experience. It's a good 2km walk to the place where we can leave our bags in a tent guarded by men dressed in camouflage gear. I give my dad the race T-shirt I just received from this race and my Skins tights. The rest I leave in my bag. I am so glad that my parents gave me two old throw-away shirts, instead of one, as it is cold and I wear them both as my dad and I walk back towards the starting area. I do a five-minute jog to warm up, followed by four sprints. 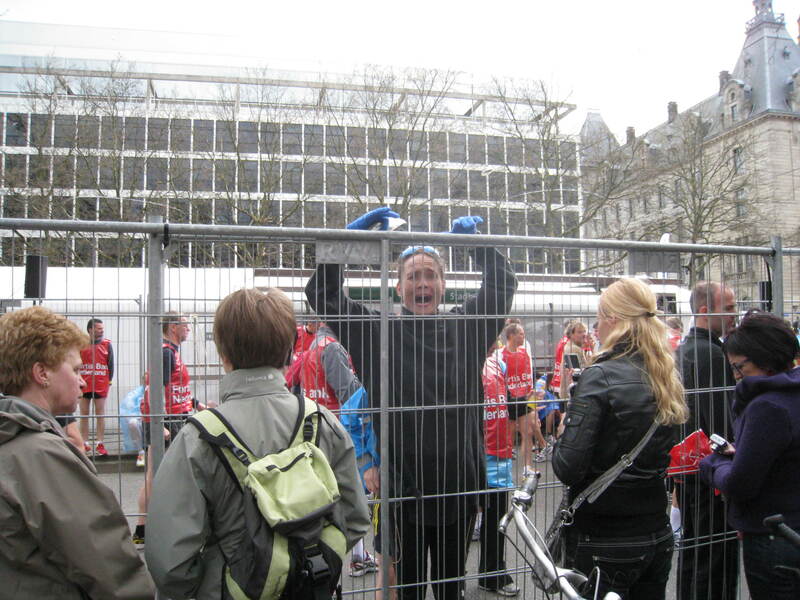 As I reach my starting area (there are six for individual marathoners plus one for those running the race as members of relay teams), my dad wishes me well and I walk through the gates. It's 25 minutes until the start of the race. My starting area D is behind section C which is reserved for runners who have shown proof that they ran a sub-3:05 marathon in the previous 18 months AND behind the section that has the relay marathoners. In hindsight I should have applied for a start from section C, as it takes me 77 seconds to reach the start line which of course is NOT counted in my net marathon time. It turns out that I am stuck behind runners who run at a slower pace. My first 3km takes me 14:44, or 74 seconds more than my planned pace of 4:30 per km. While it is better to start too slow than too fast, those first kilometres are a frustrating experience of weaving around slower runners which eat up precious physical and mental energy and I am annoyed with myself for not having secured a better start position. Then I clear those thoughts from my mind and focus on settling into my4:30/km pace which I am able to do from 4km. My Polar watch shows my lap times which I take at each kilometre marker I notice. I play around briefly in an effort find the setting that shows both my current lap time as well as my overall time before deciding to simply focus on lap time only. All I need to do is to keep my kilometre-pace at around 4:30. And repeat. In the first 7 kilometres I am warm and wonder if my decision to wear a 3/4 pant instead of my shorts has been a wise one. But soon the strong wind confirms my choice. I wear gloves, bright blue ones that they give to participants of the Vancouver Marathon.I only throw them away, somewhat reluctantly, after 36km. My nutrition plan is working. I already feel like having an Powerbar energy gel after 8km and have one. Usually I wait until at least 45 minutes, or about 10km. I have brought 9 gels, of which I carry three in a small ziplock bag in my hands, two in each of my two backpockets of my top, and another two in the only pocket in my 3/4 tights. By 40km I have my last one.I drink water at each aid station of which the first one isn't until 6km and are then 5km apart, as I had read on the race website. The paper cups have white sponges on top of the water, with two small indents that allow for drinking without spilling and without slowing down. Far, far ahead of me. The kilometres are going by fast. There are plenty of guys to run with: unfortunately I don't run with any women: the ones I see I pass straight away. I run with a little group until I move on to the next one. 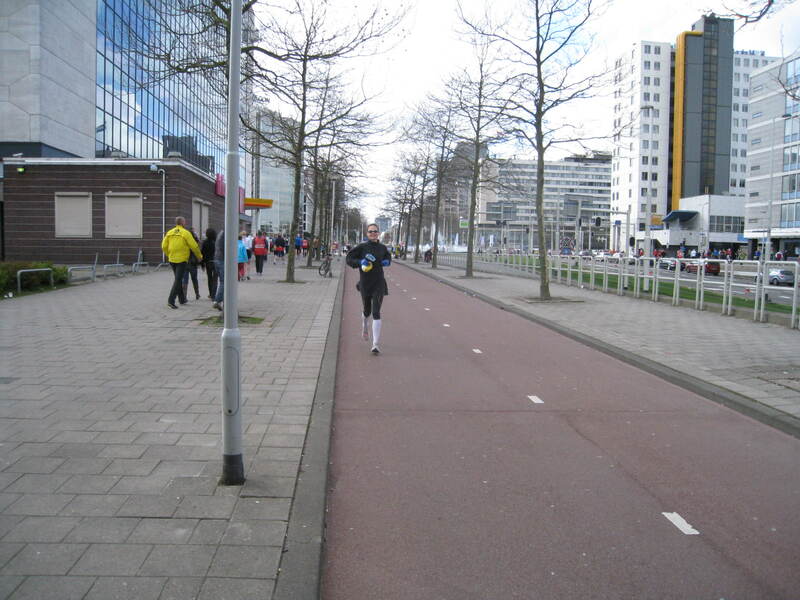 Because of my start position I pass a lot of people, though am occassionally passed by another male runner. I am pretty sure no female runners pass me during the race, though plenty finish ahead of me. I am relatively comfortable, though remember thinking and expecting from about 17km until about 27km that the final third will be a challenging one. I keep seeing consistent splits for each kilometre, which boosts my enjoyment of the race. I feel focused, in control and there is nowhere else I'd rather be than right here right now. Overall it was a good race and I am happy with my negative split (running the second half faster than the first half).